There’s a secret to a good steak: 1) Buy a great piece of meat, and 2) don’t mess it up. Number 1 isn’t difficult – expensive, but not difficult. It starts with “know your butcher and don’t be afraid to ask for advice.” And make sure the meat is USDA prime, choice, or Angus. Unfortunately, Number 2 can be very difficult. There are unlimited ways to mess up even the best piece of meat. When I cook a steak at home, the rule is KISS – keep it simple stupid. Steak is a simple food and it should be prepared simply. I’ll give it a squirt of lemon and a sprinkle of freshly ground black pepper. I might add a bit of granulated garlic. Do the same thing to the other side when you turn it in the broiler. Then, give it a hit of salt to taste on the way to the table. For me the hit is more of a tap, just enough to be present. If you like your steak cooked beyond medium rare, you probably should read no further. I prefer mine rare. I can tolerate medium rare if I must. 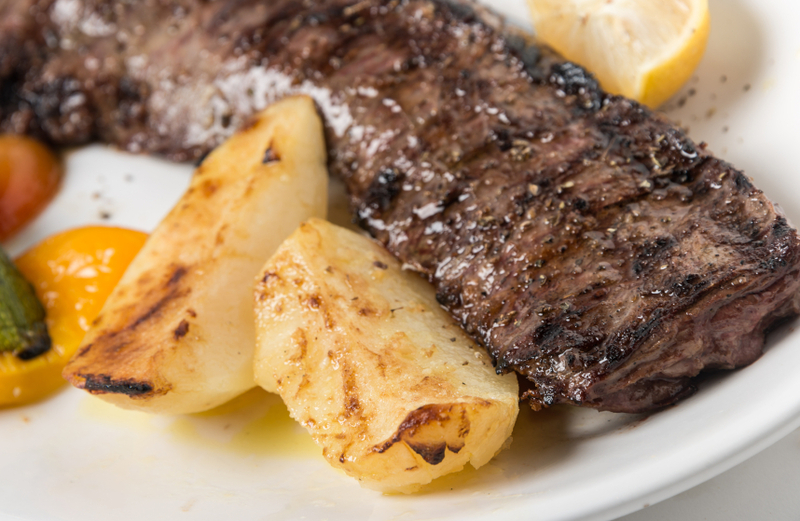 The only steak I will tolerate beyond that is my favorite steak – skirt steak. I’ve been eating it all my life. It’s well marbled with fat to assure its flavor. If it happens to be over cooked, that’s OK too. It takes on a different but still good flavor. If you are buy skirt steak be careful. Packaged meat labeled ‘carne asada’ looks the same but it isn’t. It will be very tough if cooked like you would cook skirt steak. Real restaurant quality carne asada and Mexican home cooks will not use the super market ‘carne asada’ meat. They will use true skirt steak. The other thing to watch out for is something sold as ‘pinwheel steak’. I’ve had several butchers, even at quality shops, tell me ‘pinwheel’ is skirt steak. We bought it once. It isn’t skirt steak. It’s a different cut pounded thin to tenderize it. It has no fat and almost no flavor. Other than skirt steak, my favorites are T-bone, porterhouse, some rib eyes, and flat iron. Just as long as it’s prime, choice, or Angus. I find New York steak can be too tough and filet mignon has no fat, thus no flavor. The only reasons I can think of for doing anything to a steak other than KISS are 1) bored chefs, or 2) a desire to camouflage inferior meat. Too many restaurants feel they have to marinate skirt steak in soy sauce. A recent restaurant skirt steak fad is to top it with chimichurri. I don’t understand that any more than I understand the lump of butter – seasoned or not – melting on top of a steak. Why would anyone want a romesco sauce on a quality piece of meat? Béarnaise? Béchamel? What are you trying to hide? OK. Now it’s time for all you steak lovers to reach for your keyboard and tell me how wrong I am. It’s time, also, for me to confess that I’m a steak liker, but not a lover. I like a nice steak once in a while. I’ll cook one for dinner every month or so and order one in a restaurant maybe two or three times a year. But I can spot the difference between quality meat and the rest and if the result I get at home is any indication I think I know how to cook ‘em right. Assuming you’ve gotten step one correct and the steaks in your refrigerator are of the best available quality, the first thing you need to do is take the steaks out of the refrigerator and let them get to room temperature before cooking them. For a thin steak that means about 30 minutes. For a thicker cut plan for about an hour. Go right from the refrigerator to the broiler or pan and you are likely to end up with an unappealing gray outside and an undercooked inside. Many TV cooking shows and food magazines complicate the quest for the best looking steak by telling us to sear it in a hot pan before finishing it in the broiler or oven. There are other ways to accomplish the same thing without creating an extra pan to wash after the meal. I have found it works to preheat the broiler to medium, put the steak in the oven on a rack over a roasting pan, cook it for a minute to two less than you ordinarily would, depending on how thick it is. Then turn it over and cook it for another minute or two less than usual. Next, jack the heat up to high for about a minute. Check the steak and give it another 30 seconds or so. If you can judge a steak by the feel, great. If not use a good instant read thermometer. As far as I’m concerned, that’s all there is to it. Just be sure to take the steak out of the broiler and let it set for 5 to 10 minutes before serving or slicing. That will allow the juices to seal in. If you cut it too soon the juices will run out and the steak may be dry. Remember, also, the interior heat of the steak will continue to cook the meat while it’s setting. So be sure you remove it from the heat before it reaches your desired doneness. I prefer the broiler to a stove top pan or grill. But the same principals apply if you want to stove top it. I may be in the minority, but I don’t like steak that is grilled over wood because I find the steak picks up too much of the flavor of the wood. That’s another way a restaurant can disguise lesser quality meat – cook it over mesquite and pour sauce over it. The final tip, actually a must: if you are slicing the steak before bringing it to the table as you would a flat iron steak, be sure to slice it across the grain or it might not be chewable. Jim’s picture is on the wall at three of the Palm restaurant family. He considers his connection to each of those restaurants to be very personal. Jim also loves Morton’s for the “excellent filet mignon and especially their Cajun Chicago bone-in ribeye, juicy and tangy.” As an Orange County CA resident, Jim’s name is on wine locker #1 at the Morton’s at South Coast Plaza, a steakhouse he visits and at which he entertains frequently. Victor has two standby steakhouses. At Dal Rae in Pico Rivera CA he likes the pepper steak. “The pepper sauce with fresh onions and bell peppers works wonders on a 12-ounce filet mignon or 16-ounce New York,” Victor says. At Bollini’s in Monterey Park CA he orders the rib eye, prepared by a second generation chef-owner who trained in Italy. The steak is cooked in a wood burning brick oven and weighs in at 22 ounces. “It’s hard to imagine better steak-eating than at Carnevino run by Mario Batali, Joe Bastianich and Jason Neve at the Palazzo Hotel in Las Vegas. They start the preparation months before you get there. The beef, advertised as both hormone and antibiotic-free and exceeding USDA prime standards for marbling and flavor, spends 60 to 90 days in the restaurant’s dry aging facility in anticipation of your arrival,” Larry says. Larry adds, “Porterhouse steaks have a bone that separates tenderloin filet from a larger strip steak. Carne Vino’s version brings out the distinct flavors of each part of the steak, from the deep beef essence of one slice to the rich sweetness of another. Another of Larry’s favorites is The Tornado Streakhouse, a block from the Capitol building in Madison WI. It’s an old-school supper club featuring relish trays, fresh bread and hand-cut steaks in a setting of booths and dark wood paneling. The building, constructed in 1873, has been designated an historic site. The menu is a throwback as well, with appetizers including shrimp cocktail, escargot, Coquille Saint Jacques, and oysters. But the steaks are the stars. 21-ounce T-bone, an 8 or 14-ounce filet, a 16-ounce New York strip, a 16-ounce sirloin, and a 28 ounce ribeye on the bone. Finally, Larry offers up the T-bone with herb-roasted red potatoes at the Elk’s Lodge #3 in San Francisco on Friday nights, when visitors join members under the high ceilings of the grand old building on Post Street. “As soon as you step into this architectural marvel built in 1924, you feel time evaporate. Great bar. Great food. Historic surroundings,” Larry says. Rod has three favorites. First up is Cut in the Beverly Wilshire Hotel in Beverly Hills CA, where he orders the bone in New York. Next is the Cajun ribeye, which he will order at any Morton’s in any town across the country. “When I’m in a strange place, it’s like home,” Rod says. Finally, there’s Mastro’s in Los Angeles. “I love their bone-in fillet with lobster mash potatoes. I also enjoy the piano bar on the second floor. It’s loud but I enjoy the atmosphere, sometime,” Rod says. Lloyd wonders: “Do steakhouses even exist anymore? And if so have any new, non-chain restaurants, opened in the last year, five years, ten years? The only one I can think of is Tom Colicchio’s Craftsteak in Las Vegas NV. In Sacramento I can’t think of any. There’s a Morton’s, but that has been around for a long time and is a chain – a high end chain, but a chain nonetheless. The same goes for the local Ruth’s Chris. “There is one steakhouse in the traditional sense (meat hanging and aging in full public view when you come in, wine lockers for people who want them, etc.) and that is Chop’s, half a block from the capitol. But it really isn’t that good. It stays in business because of its proximity to the capitol more than anything else. If you were to ask me where to get a good steak in Sacramento, I would suggest Morton’s and Ruth’s Chris before Chops. Tab like Harris Ranch Steakhouse on the I-5 in the Central Valley of California. The best rib eye I’ve had in a long time was served at the Stillwater Bar & Grill at lunch after a disastrous round of golf at Pebble Beach. It’s not easy to enjoy a meal after the mess I made of the course that day. I knew I could beat the score I shot by at least 20 strokes if I went back out immediately. But I don’t know if I’ll ever beat that steak. I’ve had excellent steaks at Morton’s and Ruth’s Chris. Each is kind of a sentimental favorite. The night before my son, Lloyd, as seen above, was sworn in for his first term as a member of the California State Assembly, we had a celebratory dinner at Morton’s in Sacramento. As for Ruth’s Chris, ya gotta love a place that counts Kathleen Poirier, one of our atLarrys.com co-hosts, as a key employee in the kitchen of its Marina del Rey CA kitchen. Another favorite is Lala’s Argentinean Grill in the Studio City neighborhood of the San Fernando Valley in Los Angeles. Not just great steaks, but also great meals. 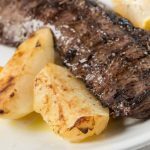 One look at the variety of skirt steak offerings on the menu and you’ll understand why I like this place. Bourbon Steak, operated by Michael Mina, in the lobby of the St. Francis Hotel is an extraordinary meal in an unbeatable, elegant setting. I’ve dined there several times and always look forward to returning. As for Las Vegas, I’m a fan of Prime at the Bellagio Hotel. Love the steaks; love the room; love the wine list; love the bar; love the staff. Lala’s Argentinean Grill is also one of my favorite restaurants in the Studio City. I always visit them because of their juicy and flavorful Milanesa. The steak that you shouldn’t miss.